I’m a NJ native and have friends who went to Rutgers. They were all good kids and even better adults. And I still consider Rutgers a solid school with less ivy than Princeton, but less drinking, too. Boy, was I shocked when I heard about this kid who threw himself off the GW Bridge because he was outed on video by his Rutgers roommate. I mean isn’t that Webster’s definition of BULLY? 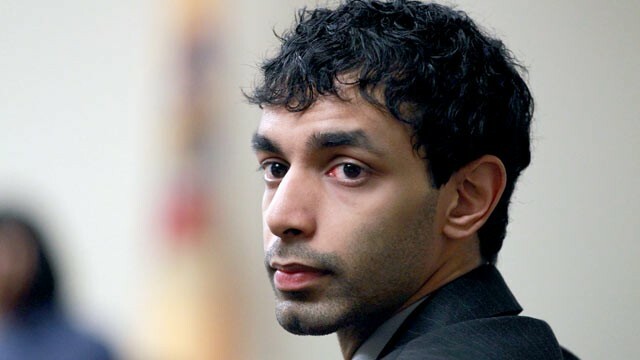 Dharun Ravi faced 10 years behind bars after a jury found him guilty on all 15 counts, and literally sat stone-faced day after day. No remorse. No emotion. Even the judge said to Ravi, “I haven’t heard you apologize once.” Unfortunately, the judge didn’t have the cojones to throw the book at Dharun, which is exactly what he deserved. It’s obvious his webcam spying was the tipping point for roommate Tyler Clementi, who must have felt shame so intense that he thought he had no options. Incredibly sad for a gay kid in the NYC area to think he has no options. I mean we’re talking NYC here. With the best pizza, the best bagels and the coolest Halloween costumes you’ve ever seen on parade…not to mention Broadway. Listen, if this wasn’t a hate crime, then I don’t know what a hate crime is. No, Dharun didn’t tie Tyler to a bedpost and let him starve to death, or shoot him at point blank range, but he did the closest thing to it. He humiliated this college boy to the point of no return. What would I do to Dharun? Well, I don’t believe in the death penalty, so that’s out. But, I do believe he should have been shown the prison door for 10 years and heard it bang shut behind him. I’d also go a step farther. I think he deserves to be totally humiliated so he knows what it feels like…even more than seeing his face above the fold on every newspaper and online news in the country. Maybe that means forcing him to go on Ellen or Anderson and let them question him. Better yet, anything this punk earns from this prank-turned-crime should go to a credible gay, lesbian and transgender charity. But a sentence of 30 days in jail that’s being appealed is like a walk in the park for this brat. Can’t we do better than that?